are on the ground, attending the event in person really lets you see the event's grandeur and spectacle. Nothing compares to being among people who traveled from around the world to support their country and enjoy this festival of football. Germany v. Algeria and Belgium v. USA in Iguaçu, two cracking games that were a few breaks away from being two huge upsets. Aussies: Most were on a leg of their seemingly endless holidays. (Trust me, Aussies love to travel.) They probably traveled the farthest to support their team—who were ranked lowest in the tournament and place in one of the tougher groups. Nevertheless, the Aussie fans were loud, jovial, and always ready for a good time. South Americans: Given the close proximity to Brazil, I knew there were going to be a large amount of South American fans, but damn... these guys were everywhere! I heard reports of the army of Argentinians who invaded Rio for their opening match against Bosnia. I saw with my own eyes the number of Colombians throughout Brazil—they dominated the Copacabana for their Round of 16 match against Uruguay. I have to give special props to the Chilean fans: anytime you break into the media room at a stadium, you are crazy fans. The Chileans always seemed to travel in huge packs, belting out their chant wherever they went: "CHI-CHI-CHI….LE-LE-LE, VIVA CHILE!" European nations: Bolstered by a new sense of pride in the national team after the mutiny of 2010, the French were loud and proud, belting out "La Marseillaise" at every occasion. The Spanish were loud at first but quickly quieted after their last shot at glory ended after just two games. The Dutch had a nice blend of modest expectations, passion for their team (Groups of Dutchmen reportedly shipped their cars to the USA and drove down to Brazil), combined with a willingness to party. There were plenty of Germans and they were always going to be heard, but as I wrote earlier, this was a business trip. The Germans would have some fun, yes, but victory was the priority. African nations: An African team has never won the World Cup, so qualification is treated as a huge national honor. The fans who made the long trek over the Atlantic brought many of their local songs, dances, and clothing into the stadium, creating a really unique atmosphere. I mentioned how much the Ghanaian fans impressed me when their team met the USA in Natal, but I also had the opportunity to meet some Algerian fans in Rio after the USA match. They were nervously awaiting their match against Russia, but you could see on their faces how much qualification for the Round of 16 meant to them. I was really happy to see them go through. USA: We have some of the best fans in the world. (I know, I am a homer.) 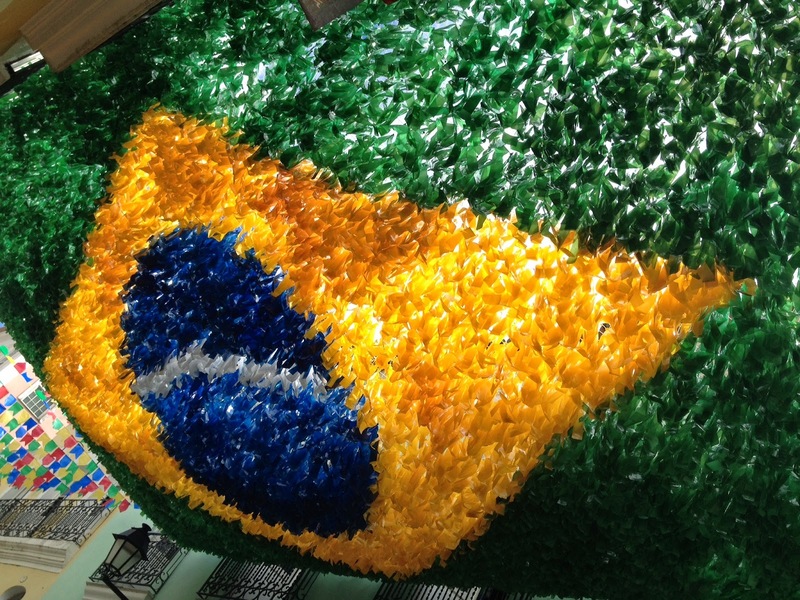 We were all over Brazil; and even other teams' fans remarked on our strong showing. With our volume and passion, we made our games feel like they were being played back in RFK Stadium in Washington, DC. As we continue to grow as a soccer nation, I hope our fan base grows with it. The bottom line? If you are a soccer fan, a sports fan, or just someone looking to be around a truly international and cosmopolitan event, go to the World Cup. You will not be disappointed. As I was leaving Natal for Manaus, I spoke to the guesthouse owner and asked her, in Portuguese, for a taxi to the airport. She seemed a bit perplexed, asking me where I was going and when I needed to be there, but she still assured me a taxi was en route. About 30 minutes later, she motioned me to come outside and there was no cab, but a young man in a white Fiat who greeted me in English. I was confused, to say the least, but she motioned me to get in the car and a moment later we were off. The man introduced himself as Hegor and insisted that we speak English because he needed to practice. I learned that he was in college, studying to be an engineer, but was on an academic break right now because of the World Cup. Traffic was so heavy that we were obliged to drive around all of Natal, with Hegor explaining to me about each part of the city as we drove through. When we approached the Arena das Dunas, I mentioned how I liked the stadium and Hegor replied: “Yes, it's nice, but we don’t need it. The two clubs here will not come close to filling it.” Hegor then asked me if I enjoyed Natal and what I thought of Brazil. I told him I liked the city and wished I could stay longer, and that I was really enjoying Brazil thus far. I then asked him if he was enjoying the World Cup. Hegor replied that, yes, he enjoyed having tourists in Brazil and loved the fact that the World Cup is here. He paused and then got a bit emotional: "But I don’t like the fact that our country is struggling and so much more could be done, yet we are building stadiums and spending all of this money. You see it yourself." I nodded, remembering how earlier we had crossed Natal's Zona Norte, home to some extremely impoverished neighborhoods and roads and facilities that needed massive improvements (a common trend I noticed throughout Brazil). Before coming, I spent months hearing all the worries about whether Brazil's World Cup would even happen, and reading about all the strikes, riots, and protests. After spending three weeks there though, I don’t think you could have asked for better hosts for the World Cup. Throughout the tournament, the Brazilian national team rode the emotions of their people. I have seen it firsthand: everyone in Brazil is 100 percent behind their team. On match days, every Brazilian donned a yellow shirt, and the entire country shut down. In the stadium, when their national anthem was cut short after a FIFA-mandated 90 seconds, the passionate Brazilian fans kept singing a cappella. Now I am all for emotion—hell, I am a Ravens fan who had the pleasure of watching Ray Lewis work the players and fans into a rabid frenzy before games for 17 years—but I think Brazil took it a little too far for the semi-final, when their players mourned the injury to superstar Neymar Jr. as if he were some sort of martyr. They thought if they showed they wanted it bad enough, they would win the World Cup. Their opponents, the epitome of calm, tore them apart with an efficiency that can only be described as, well... German. Many will remember the Brazilian team because of the fact that they gave up 10 goals in 2 humiliating final losses, but I will also remember the joy, unity, and passion they brought to all Brazilians through both their performances and the emotion they displayed. My only wish was that it ended slightly better for both the team and the people. While definitely soccer-crazy, Brazilians are also some of the more friendly and kind people that I have met in my travels. Regardless of whether or not you spoke Portuguese, they would do whatever they could to help you. Minus my own mistakes, my travels within Brazil were seamless. Additionally, there was a major police presence in all of the cities, leaving very few instances where I felt unsafe. Granted, Brazil has problems with water, which make showering and using the bathroom difficult sometimes, but you quickly got used to that. While there were some demonstrations, they were more subdued than those in the months leading up to the Cup, maybe because of the increased police presence but also, I think, due to a change in mood in Brazil. When I asked Brazilians about their thoughts, some said they were happy that the World Cup was here, and "People weren’t complaining when we were awarded it in 2007, so stop protesting and just enjoy it." Granted, this was partly dependent on Brazil’s success in the World Cup, as my Corcovado climbing guide Lucas told me: "If Brazil lose, everyone is going to flip the Maracanã upside down!" While I was glad there was no explosion of grief when they lost, I do wonder what will happen now that the World Cup is over. Perhaps the country won't slow down: just after the World Cup they met fellow emerging powerhouses in the BRICS (Brazil, Russia, India, China, and South Africa) Summit, seeking pathways to prosperity. Having experienced a bit of Brazil, I am definitely keeping an eye on the country. With a presidential election in October and the Olympics in 2016, I am really curious to see if it can continue its forward progress and become a major player on the global stage. No matter where I go, I will never forget my time in Brazil. I will always carry with me some great memories of the Brazilians I met (George and Hegor, the Paulistas, Cariocas, and Bahianos), the other expats I befriended, the majestic places that I visited (Christ the Redeemer, Copacabana/Ipanema, the Amazon, the Pelourinho, and Iguaçu Falls to name a few), the unforgettable sights and sounds that only a World Cup can provide, and finally celebrating Germany’s World Cup win with my German and expat friends alike in Stuttgart. Perhaps the greatest gift I can take from this trip is the realization that I am in fact a world traveler and my desire to travel to all corners of the globe has been fueled even further. I don’t know where my travels will take me next, but wherever it is, I look forward to the adventure. First, a big thank you to the founder and editor-in-chief of this blog, Andrew Farrand. I am thankful that we got a chance to collaborate through our love of travel and writing. While I have been a longtime reader of the blog, I gained a new appreciation for what he does, as writing in hostels and on airplanes with less-than-great internet is more difficult than it seems! Our friendship was forged on the soccer fields and classrooms of St. Paul’s and I am happy that it has lasted over the years. While we are both St. Paul’s Crusaders, we also share another title—that of world travelers. Second, I want to thank you, the reader, for checking out the blog and sharing in my Brazilian journey with me. In the spirit of Ibn Ibn Battuta’s mission, I hope that my experience inspires you to get out and travel more. There truly is a wonderful world out there that is just waiting to be seen, and I truly believe that travel is the only thing you can spend money on and still come home richer. Thank You, Obrigado, and Dankeschön. Gavin, Great seeing your posts on Andrew's blog the last few weeks. Sounds like you had one awesome trip! I randomly stumbled across these entries while doing a google image search and am so glad I did! Since returning home from my own trip around Brazil this past summer, I've enjoyed reading other World Cup 2014 blogs and comparing experiences. This is the best-written series I've found so far - awesome job, and kudos to Gavin for writing it and Andrew for featuring it!